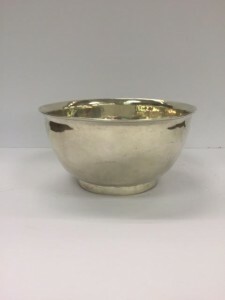 A Kinsale silver bowl with an almost mythical status has surfaced with well known silver dealer William Crofton of L and W Duvallier, Dublin and London. A second generation dealer of 40 years standing Crofton said the piece – made by Robert Armstrong around 1750 – is the rarest provincial bowl he has ever had. “It is very hard to describe the feeling you get when you see such a fantastic piece out of the blue. I believe only enthusiast’s or collectors regardless of what they collect can truly relate to it” he said. “As I turned the bowl over it was like time stood still and it took me an extra couple of seconds for my brain to workout exactly what I was looking at. It is the only time I have ever come across this maker in real life in nearly 40 years”. There are less than six pieces known to have been made by Robert Armstrong. The definitive work on Cork Silversmiths by John Bowen with Conor O’Brien makes the point that Kinsale’s ancient significance derived from its position as the most important sea port on the southern coast of Ireland. A nearly identical bowl by Robert Armstrong is illustrated in Irish Georgian Silver by Douglas Bennett. Bowls of this type of different sizes were made throughout Ireland in the first half of the 18th century as speciality items. This one is on offer with a price tag of around 45,000 euro. 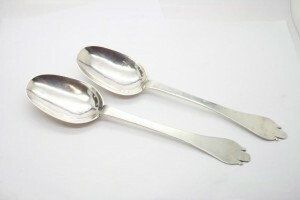 A pair of Kinsale silver trefid spoons. The only known pair of Kinsale trefid spoons will feature at Weldon’s stand at the National Antiques and Vintage Fair at the South Court Hotel in Limerick on March 19 and 20. By Joseph and William Wall they were made c1695-1705 and are real rarities. 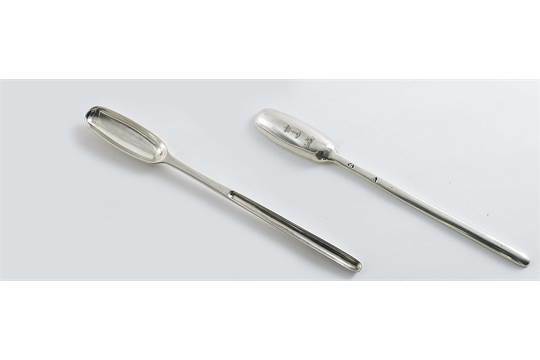 Trefid spoons are flat handled with a stem that widens at the top with two notches that form a shape with three lobes. Irish provincial silver is much rarer than Dublin silver. Antique Kinsale silver pieces are prized by collectors. Weldons say it is likely that they were owned by the Daunt family of Tracton Abbey near Kinsale.